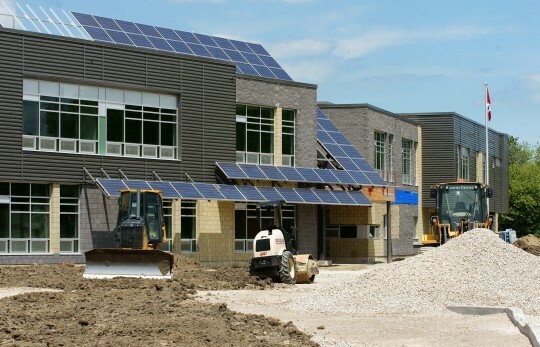 Windsor’s Dr. David Suzuki Public School, to be a certified LEED Platinum facility, is nearing completion in the city’s Riverside area. According to the Greater Essex County District School Board’s very own webpage for the school, construction is progressing along on track toward the new school year. The building, with dozens of attached solar panels, stands tall over the site which only eleven months ago was but a plain of gravel and foundation components. The Board’s website features three webcams pointed at the construction site and multiple photo galleries from the past two years. The new school replaces the same property which once was home to Princess Anne Public School on Raymond Ave. The school was designed by McLean + Associates Architects (the firm that designed the acclaimed Lakeshore Discovery School). Dr. David Suzuki School will feature a wind turbine, multiple solar panels and other energy efficient technologies. It’s scheduled to be open to students later this year.